Based out of NAS Lemoore, CA flying the McDonnell Douglas F/A-18C Hornet, they were established in March 1952. They participated in Desert Storm in 1991 with CVW-11 and the USS Lincoln (CVN-72). They now fly from the deck of the Carl Vinson (CVN-70). Sometimes they are tasked with flying as 'adversaries', so they created this 'RED AIR' squadron patch to wear during those flights. This patch does not come with velcro attached. Based out of NAS Lemoore, CA flying the McDonnell Douglas F/A-18C Hornet, they were established in March 1952. They participated in Desert Storm in 1991 with CVW-11 and the USS Lincoln (CVN-72). They now fly from the deck of the Carl Vinson (CVN-70). 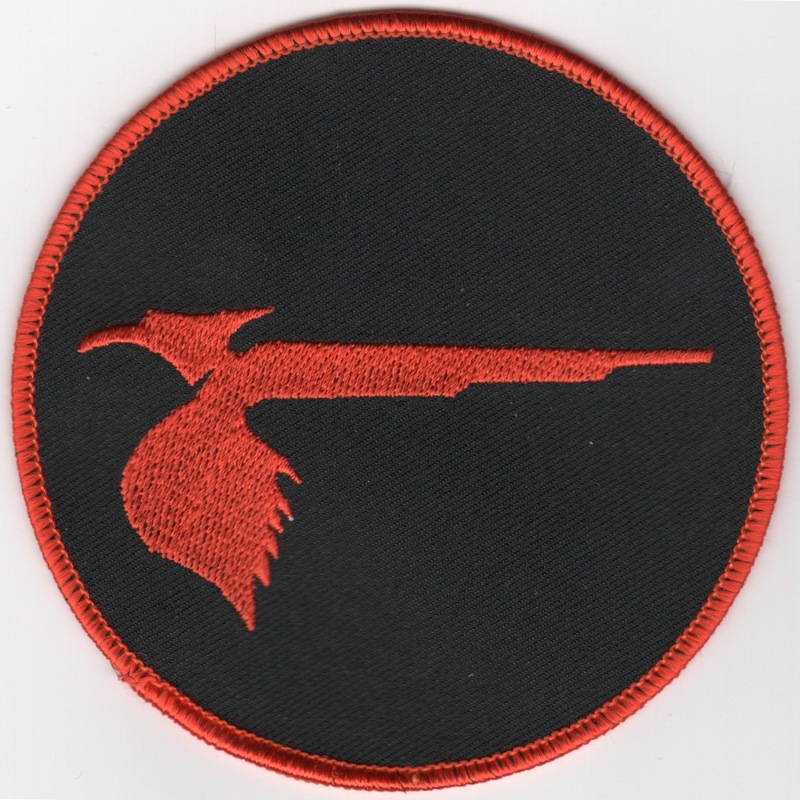 Sometimes they are tasked with flying as 'adversaries', so they created this 'RED AIR' aircraft patch to wear during those flights. This patch does not come with velcro attached. Based out of NAS Lemoore, CA flying the McDonnell Douglas F/A-18C Hornet, they were established in March 1952. They participated in Desert Storm in 1991 with CVW-11 and the USS Lincoln (CVN-72). They now fly from the deck of the Carl Vinson (CVN-70). Based out of NAS Lemoore, CA flying the McDonnell Douglas F/A-18C Hornet, they were established in March 1952. They participated in Desert Storm in 1991 with CVW-11 and the USS Lincoln (CVN-72). They now fly from the deck of the Carl Vinson (CVN-70). 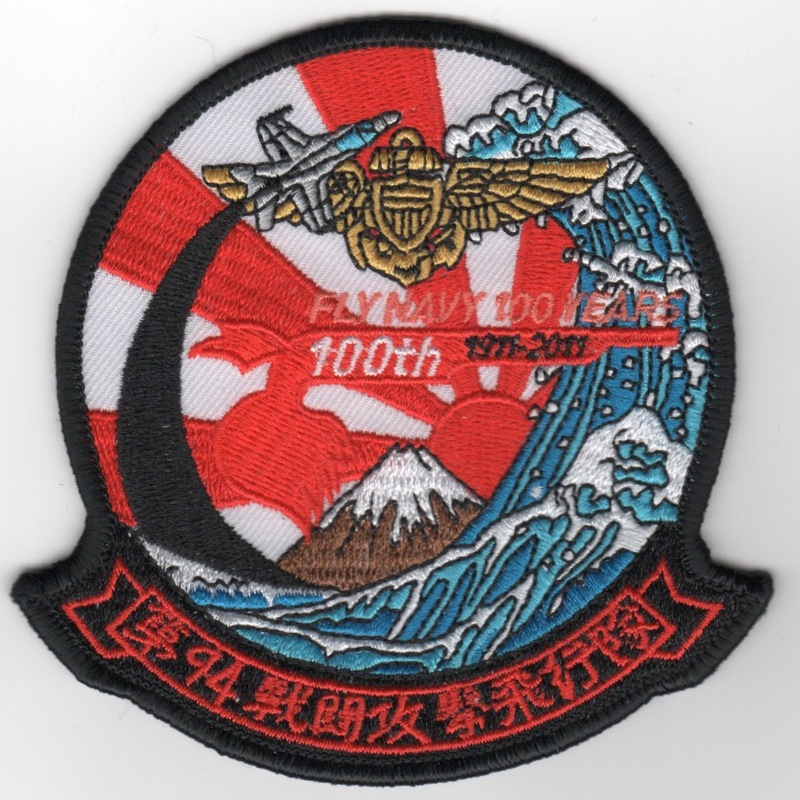 This version of their squadron patch has "Japanese script" along the bottom tab. 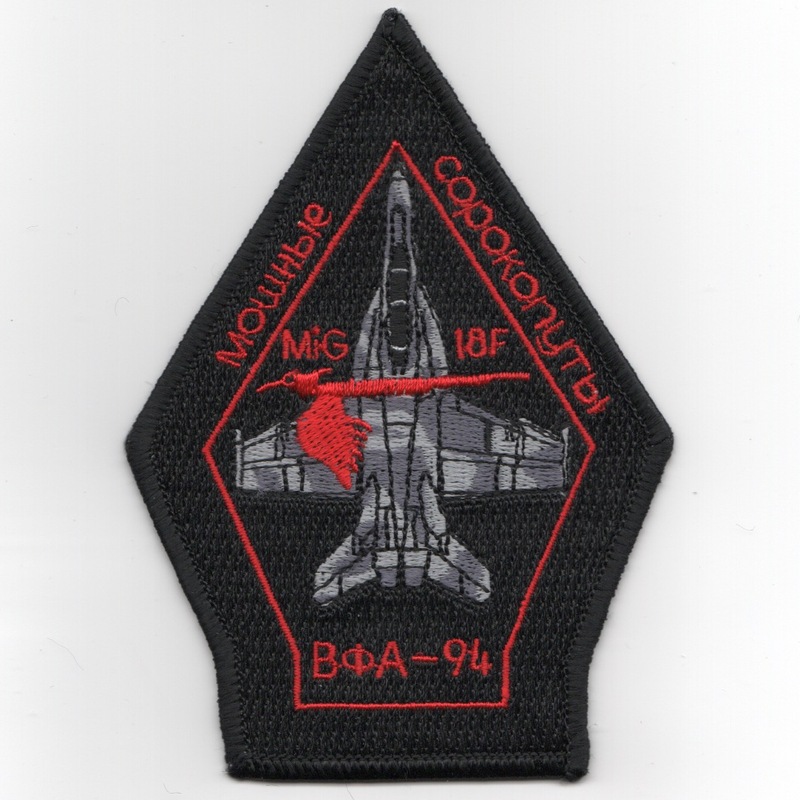 Based out of NAS Lemoore, CA flying the McDonnell Douglas F/A-18C Hornet, they were established in March 1952 and recently created this "throwback" patch to honor their lineage. 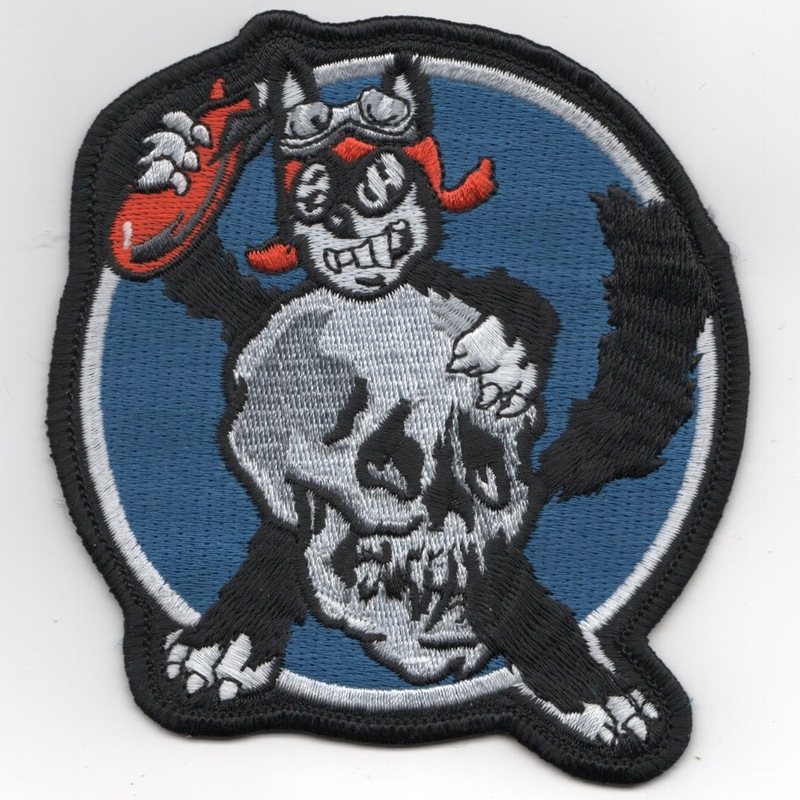 This patch shows (what almost looks like) the famous Disney character, "Felix The Cat" hurling a bomb from behind a skull! This patch does not have velcro. Based out of NAS Lemoore, CA the "SHRIKES" fly the McDonnell Douglas F/A-18C Hornet, and were established in March 1952. They participated in Desert Storm in 1991 with CVW-11 and the USS Lincoln (CVN-72), but now call the Carl Vinson (CVN-70) their home along with their sister squadrons VFA-22 and VFA-97. 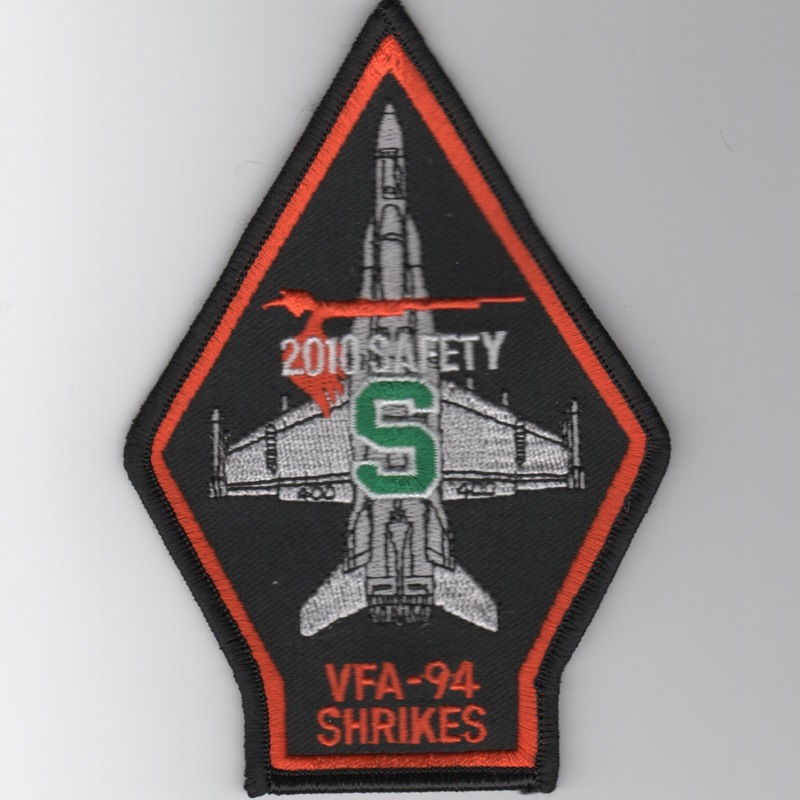 This is their 2010 Safety 'S' award patch for their stellar safety record that year! This patch does not come with velcro attached. Based out of NAS Lemoore, CA flying the McDonnell Douglas F/A-18C Hornet, they were established in March 1952. They participated in Desert Storm in 1991 with CVW-11 and the USS Lincoln (CVN-72), but now call the Carl Vinson (CVN-70) their home along with their sister squadrons VFA-22 and VFA-97. This is the black version of their 'Coffin' patch and does not come with velcro attached. Based out of NAS Lemoore, CA flying the McDonnell Douglas F/A-18C Hornet, they were established in March 1952. They participated in Desert Storm in 1991 with CVW-11 and the USS Lincoln (CVN-72), but now call the Carl Vinson (CVN-70) their home along with their sister squadrons VFA-22 and VFA-97. This is the desert version of their 'Coffin' patch and does not come with velcro attached. Based out of NAS Lemoore, CA flying the McDonnell Douglas F/A-18C Hornet, they were established in March 1952. They participated in Desert Storm in 1991 with CVW-11 and the USS Lincoln (CVN-72), but now call the Carl Vinson (CVN-70) their home along with their sister squadrons VFA-22 and VFA-97. This is the 'throwback 'version of their 'Coffin' patch they created in a light blue scheme, and does not come with velcro attached. Based out of NAS Lemoore, CA flying the McDonnell Douglas F/A-18C Hornet, they were established in March 1952. They participated in Desert Storm in 1991 with CVW-11 and the USS Lincoln (CVN-72). They now fly from the deck of the Carl Vinson (CVN-70). 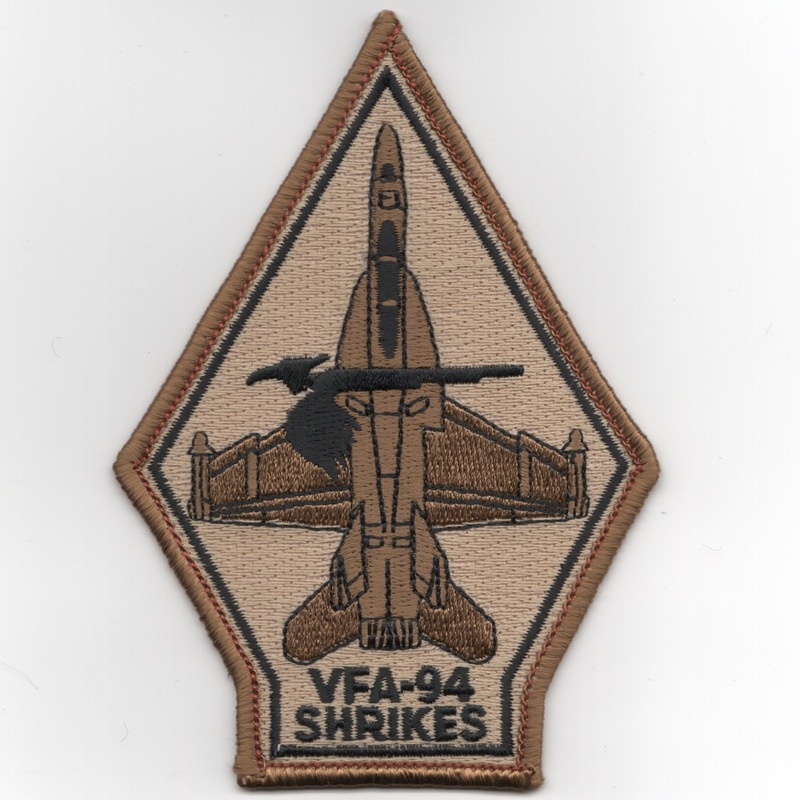 This is the color version of their aircraft "bullet" patch worn on the flightsuit sleeves. Based out of NAS Lemoore, CA flying the McDonnell Douglas F/A-18C Hornet, they were established in March 1952. They participated in Desert Storm in 1991 with CVW-11 and the USS Lincoln (CVN-72). They now fly from the deck of the Carl Vinson (CVN-70). This is the desert version of their aircraft "bullet" patch worn on the flightsuit sleeves. 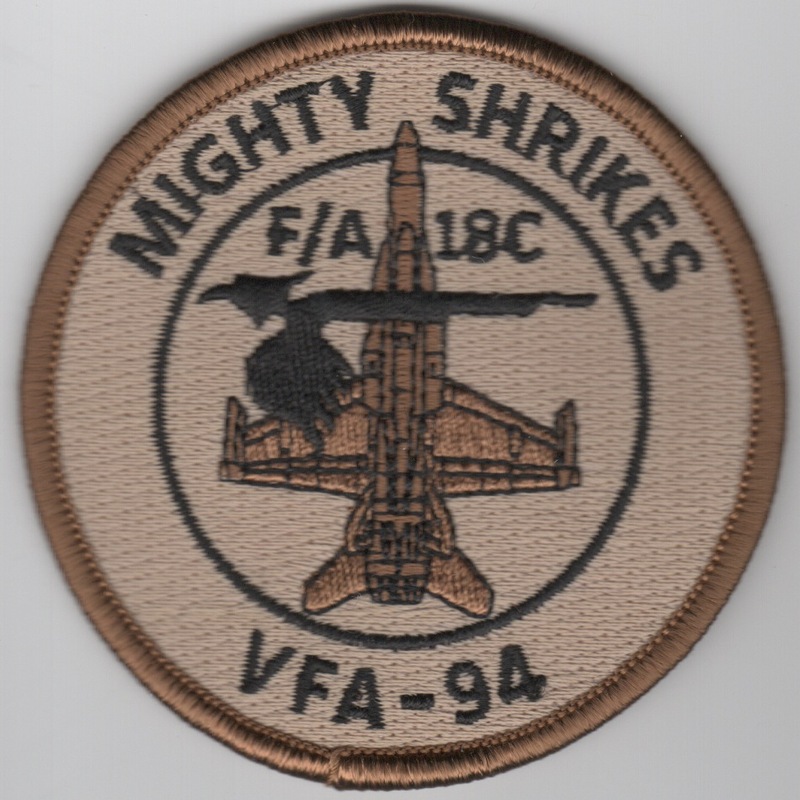 Strike Fighter Squadron 94 (VFA-94), also known as the "Mighty Shrikes", are a US Navy fighter squadron stationed at NAS Lemoore. They are an operational fleet squadron currently flying the F/A-18F Super Hornet. They are attached to Carrier Air Wing 17 (CVW 17) and based at NAS Lemoore, California. Their tailcode is NA and their radio callsign is Hobo. 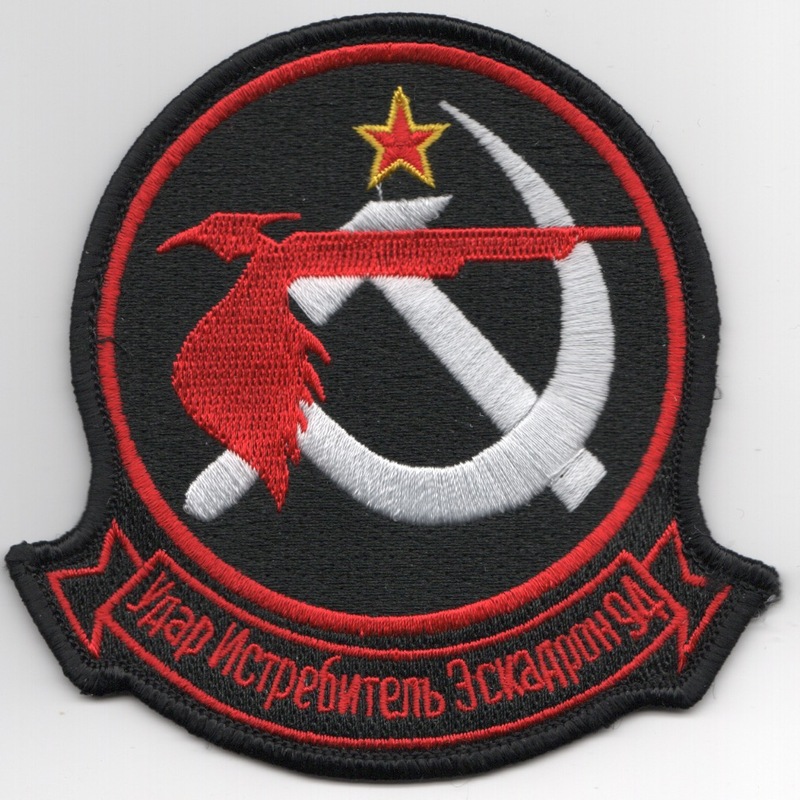 This is a new patch they created showing their mascot (the "SHRIKE", as they call him) gliding in flight.....not sure of the entire story behind this creation, but a neat patch. It does not have velcro. Based out of NAS Lemoore, CA flying the McDonnell Douglas F/A-18C Hornet, they were established in March 1952. They participated in Desert Storm in 1991 with CVW-11 and the USS Lincoln (CVN-72). 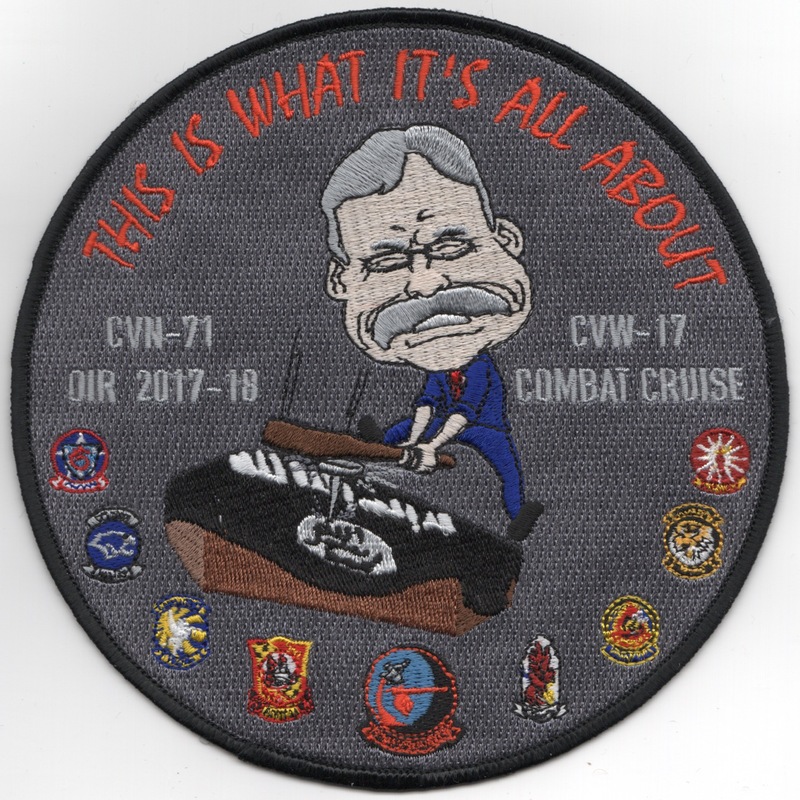 For this deployment, they were part of AIRWING 17 (CVW-17) while onboard the USS Roosevelt (CVN-71). It says "THIS IS WHAT ITS ALL ABOUT" (top) and shows 'Teddy Roosevelt' with his famous 'Big Stick' driving a nail in the coffin of ISIS. 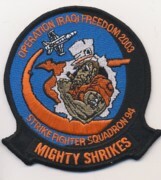 The other squadron logos are shown along the bottom border. This is a LARGE patch and does not come with velcro attached. Based out of NAS Lemoore, CA flying the McDonnell Douglas F/A-18C Hornet, they were established in March 1952. They participated in Desert Storm in 1991 with CVW-11 and the USS Lincoln (CVN-72). 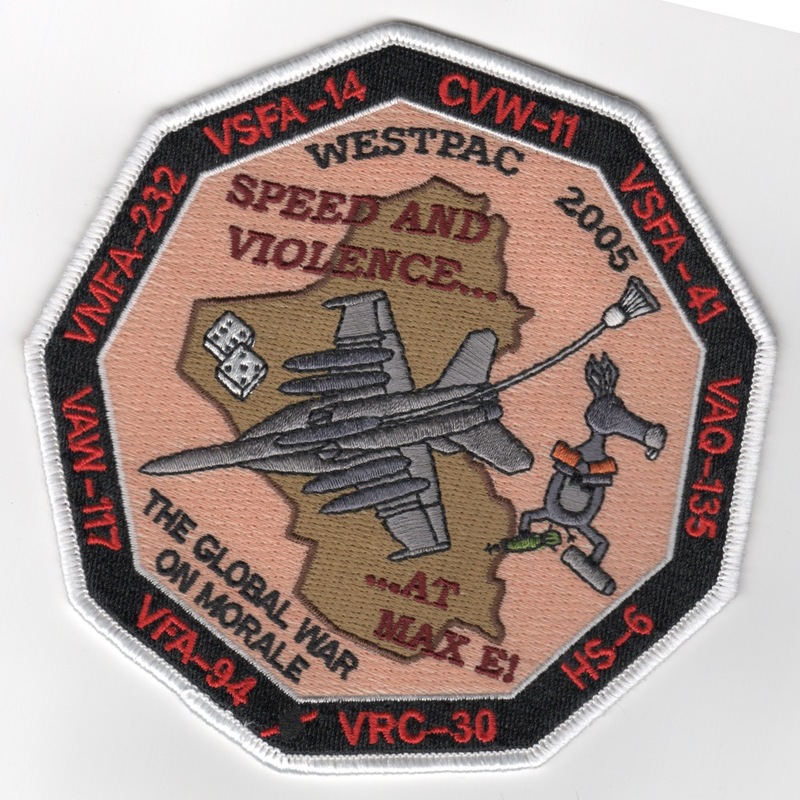 They now fly from the deck of the Carl Vinson (CVN-70) and this is their cruise patch from their 2003 WestPac cruise. Based out of NAS Lemoore, CA flying the McDonnell Douglas F/A-18C Hornet, they were established in March 1952. They participated in Desert Storm in 1991 with CVW-11 and the USS Lincoln (CVN-72). 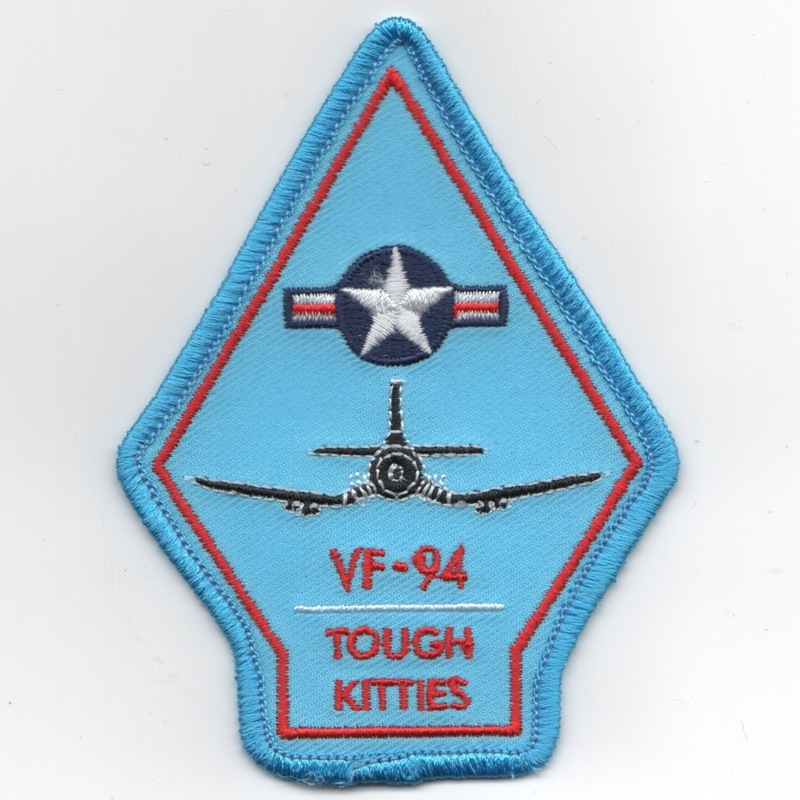 They now fly from the deck of the Carl Vinson (CVN-70) and this is their cruise patch from their WestPac tour during Desert Storm in 1991. 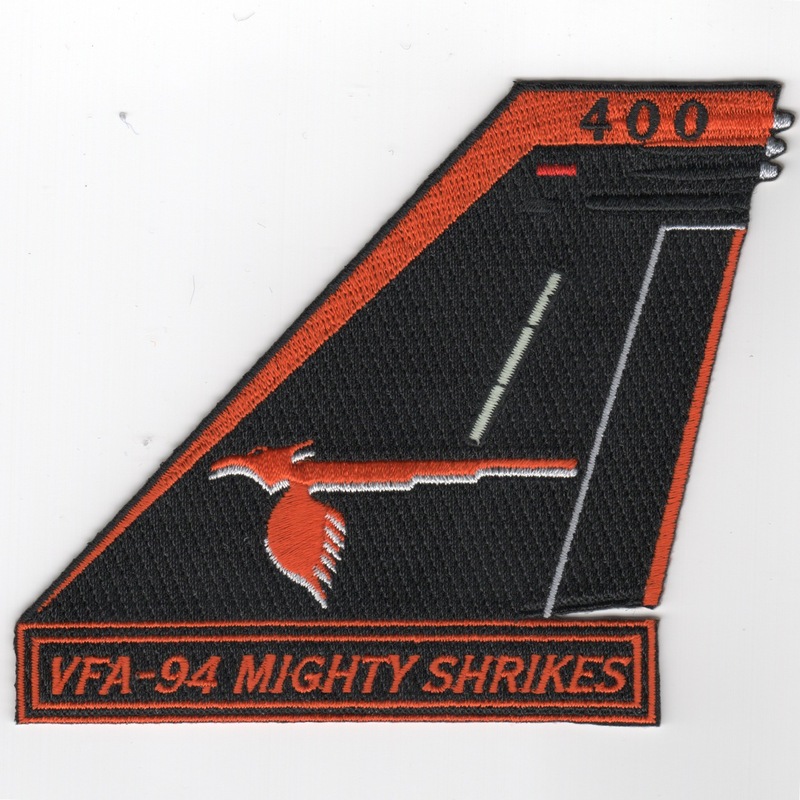 Homepage | Order VFA-94 Patches!